Saturday December 14th 1889 I was busy about the work all forenoon and in the afternoon rode to town with Will in the cart. Mother had gone on before me. Frank Stockton was here for dinner. he brought Will a load of oats. I was at Hatties awhile. Ott came home with Mother to stay all night. Sunday December 15th 1889 It was a pleasant day. Mother and I got the dinner as Winnie had to go to church all the forenoon. Will and I went to the west farm in the afternoon and told Peter that we were to have the use of the place and he would need to make a change. I spent the evening talking and reading. 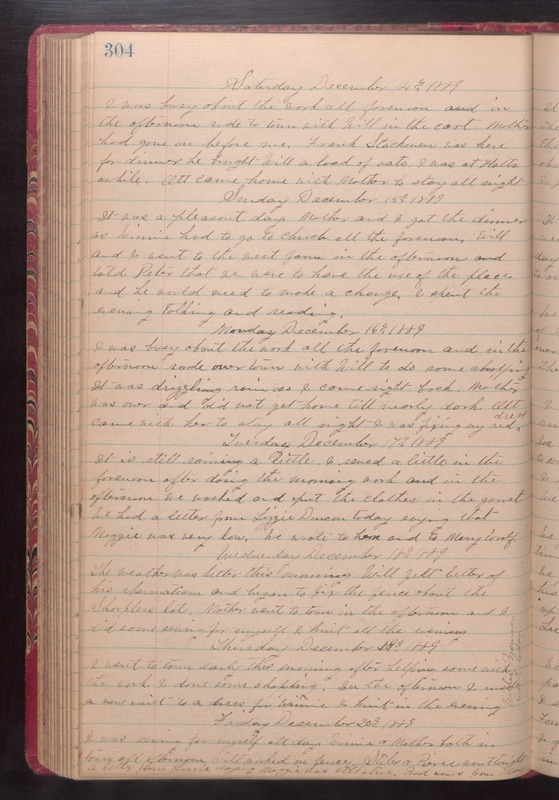 Monday December 16th 1889 I was busy about the work all the forenoon and in the afternoon rode over town with Will to do some shopping. It was drizzling rain as I came right back. Mother was over and did not get home till nearly dark. Ott came with her to stay all night. I was fixing my red dress. Tuesday December 17th 1889 It is still raining a little. I sewed a little in the forenoon after doing the morning work and in the afternoon we washed and put the clothes in the garrett. We had a letter from Lizzie Duncan today saying that Maggie was very low. We wrote to her and to Mary Woolf. Wednesday December 18th 1889 The weather was better this morning. Will felt better of his rheumatism and began to fix the fence about the Sharpless lot. Mother went to town in the afternoon and I did some sewing for myself. I knit in the evening. Thursday December 19th 1889 I went to town early this morning after helping some with the work. I done some shopping. In the afternoon I made a new waist to a dress for Winnie. I knit in the evening. [the following text is written vertically in the right margin of the above entry] Willie Bremmer went today. Friday December 20th 1889 I was sewing for myself all day. Winnie & Mother both in town all afternoon. Will worked on fence. Stiles & Pierce went tonight. A letter from Lizzie saying Maggie still alive. Bad news from May.